In the next 20 years, 10 thousand people a day are going to be retiring. One of the challenges we have in organisations today is that we have not equipped the leaders to lead the workforce. Now as the old guard starts to leave the business and the new generation comes through, how are we going to prepare ourselves as the next generation to be the leaders of that workforce. 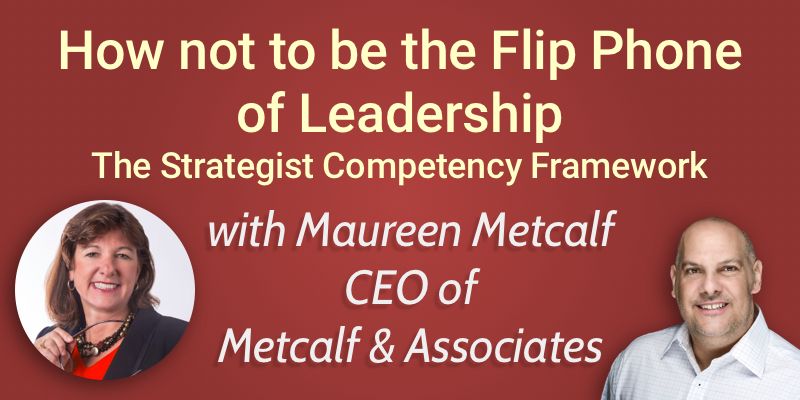 In collaboration with today’s guest, Maureen Metcalf, we gave this episode a tongue in cheek name: Don’t be the flip phone of leadership. One of the things she’s going to share with us is her Competency Framework to avoid being that flip phone of leadership. Maureen is the CEO of Metcalf & Associates, a renowned executive advisor, author, speaker and coach who brings 30 years of business experience to provide high-impact, practical solutions that support her clients’ leadership development and organizational transformations. Maureen designs and teaches MBA classes in Leadership and Organizational Transformation. She hosts her own international radio show focusing on innovative leadership, and she is the author Innovative Leaders Guide to Transforming Organizations, winner of a 2014 International Book Award. How does this Strategists Competency Framework help us as leaders? Maureen has worked with leaders for a number of years trying to transform organisations. ‘Trying’ because the success rate varies between organisations. What Maureen has seen are well-intended, skilled leaders moving forward with transformations, but often were not changing themselves at the same rate as they were changing their businesses. So that they became the problem. She watched them launch programs and then be exited. What we offer as leaders, our skill, is leadership. And if we are not staying current in how we lead, we are likely to get left behind. Much like the flip phone. It’s therefore very important to focus on our own professional development. Maureen has worked with Mike Morrow-Fox and Susan Cannon to look at how leadership has evolved over the centuries and define the competency model for what we will need going forward. This is based largely on developmental psychology. If we think of Jim Collins’ reference to Level 5 Leaders, he describes a leadership hierarchy. When Maureen draws this out, she draws a series of concentric circles so rather than going up the ladder, she looks at expanding capacity. In this way, you don’t lose what you started with, but as you go up through levels of the organisation, you continue to develop in various ways. As the world becomes more interconnected, we begin to outsource various functions of our business and so are partnering in more significant ways with companies based all over the world. This often means to make changes within our organisation, we are having to collaborate with a number of partners where in the past we would walk down the hall and tell our CFO to change something. This requires a different skillset from leaders of today and going forward. This is more about getting it right than being right. It is about being committed to the mission and vision of the organisation, rather than about individual success, promotion, bonuses, recognition etc. It’s about keeping your ego in check. When you work with a leader who is committed to this vision, the workforce is more engaged and equally committed to the vision of the company. If you’re more interested in being right than getting it right, more ego driven, you will not be open to experimenting and making necessary changes to drive success in the business. Unstoppable and unflappable when on a mission. Often as leaders, we are told to do things that are painful. When we do things that mean people we care about will lose jobs. For any good human being, this is painful but is necessary at times for the good of the organisation. None of us can do this alone. It is important to have a great support network around us to keep us on track. Companies are so interconnected that when we make a change to something that would seem minor, we need to understand how that change is going to ripple through the organisation. We need to speak to our stakeholders and partners and get their perspective on how these changes will impact all aspects of the organisation and its partners. Interest, expertise, and curiosity beyond the job. Maureen gives the example of a gentleman in a CEO forum she is a part of. He reads historical biographies. So when in discussions, he can pull from ‘what did Lincoln do?’ for example, and integrate that into what he is doing today. Another example is that Maureen was in an African drumming group – despite not having any knowledge of African drumming or any natural sense of rhythm! She mentions the leader of the group who would bring Maureen back into rhythm with the group if she went off beat – without removing her instrument. She feels that leaders in business should be the same – bringing people back into sync with the organisation, without removing their responsibilities. Not constrained by personal appearances, but highly focused on person and behaviour. This is the ability at the end of the day or of a meeting, to look back and what we have done and evaluate it correctly to establish where we need to change and grow. Some people believe that because they have a C-level job title, they are fully baked. The idea of being reflective and authentic is the awareness that we always have to be growing and confronting situations in which we are not comfortable. We talk about leadership a lot, but less about those that follow us – either because they have to because we pay them, or in some cases by choice. This is the ability to connect with people at all levels of the organisation, create a vision, and then implement that. So it’s the ability to understand and manage change, being able to defuse conflict, etc. Facebook is a great opportunity to connect authentically with people from the full spectrum of your workforce and facilitate normal conversations that allow you to connect. Welcoming collaboration in a quest for novel solutions that can bring a better output that we would have working solo. As leaders, we are working across organisations, borders, and boundaries of all kinds. We can no longer know everything we need to know, which means we have to be willing to collaborate and bring in multiple perspectives. We have to be willing to change how we think about things depending on the information we are given, rather than being rigid in our direction. This is where having a good mentorship network can be of great benefit. It gives a platform for advice, but also a sounding board for ideas that are created by listening and pulling in information from all these varying sources. (This feeds back into the 360-degree thinking mentioned earlier). How does this Strategist Competency Framework help us as leaders? Maureen points to research that showed that leaders that were successfully able to transform large, complex organisations, consistently tested at strategist level, or worked with consultants that did. So the benefit to a leader is that if you are running or transforming an organisation, you will benefit significantly from demonstrating not only the behaviours but also the mindsets behind them. You can read more at Metcalf-Associates.com. There are a lot of resources there free of charge. If you are interested in working with Maureen, you can reach her via email on maureen [at] metcalf-associates.com or go to the Contact Us section of her website. Otherwise, you can find her on Facebook Page.